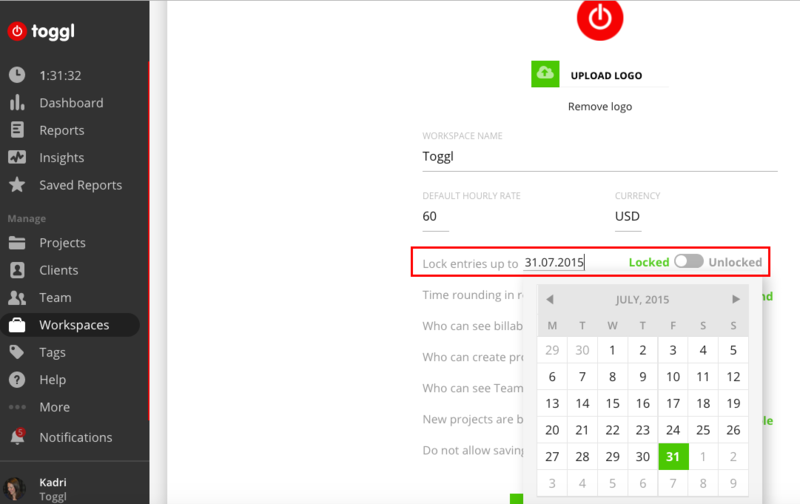 Locking timesheets is a great way to prevent back-dated entries from being entered or edited. Timesheets can only be locked in Enterprise and Premium plans. See prices of these plans and upgrade on your Subscription page. Reports can be locked on the Workspace Settings page – only administrators have access to this. Open the calendar by moving the switch from Unlocked to Locked. Set the date that you want to lock entries up to. Regular users won't be able to edit any time entries with the date July 15th or earlier. Regular users won't be able to add new entries to July 15th or earlier. Administrators can still edit and add time in the locked period.